I love creating recipes inspired by things I have seen or read. This is one of my favorites that I made a while ago for my dear friend, Frances, author of the Wordsworth the Poet series. As tomorrow is Valentine’s Day, it seems appropriate to share this sweet, romantic recipe today. “Emily knew Wordsworth could see an entire castle in a piece of driftwood buried in the sand. She knew he could see a row of dancing brides in plain white crested waves. 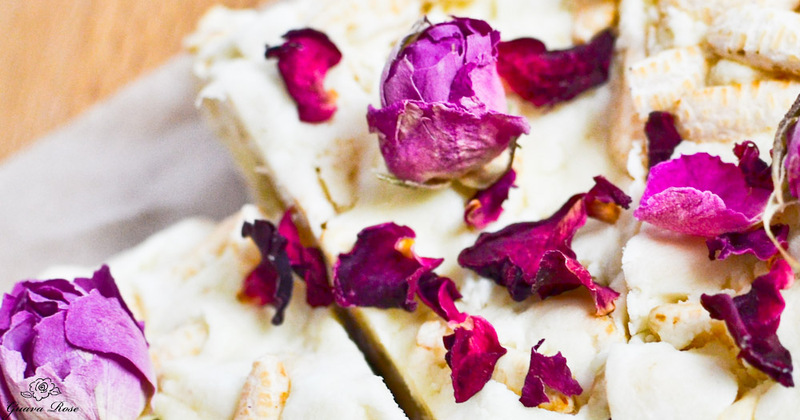 The rose petals can be eaten with the fudge, but you can take them off along with the rosebuds to make tea with them! Put them to steep in a little pot of black or green tea for a lovely rose scented tea. You can also just put them in plain hot water for a nice herbal rose tea. 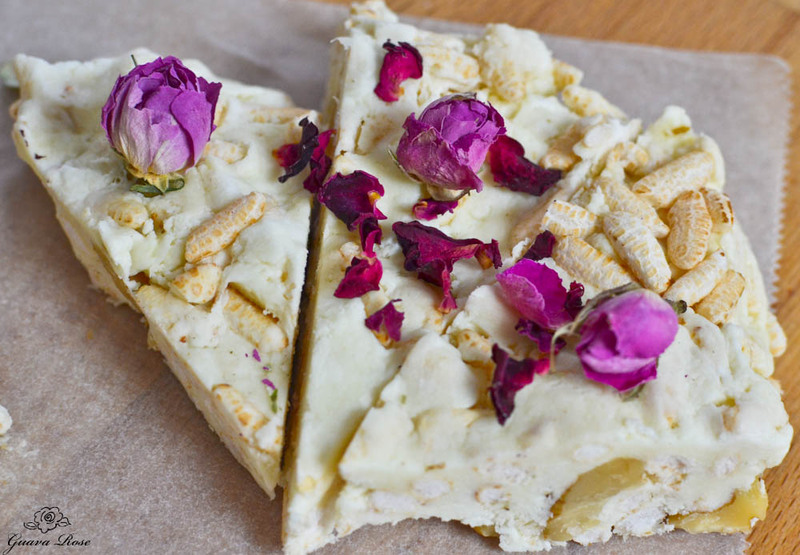 What better way to see those brides dancing on the seawaves, than while eating a piece of sweet fudge and sipping a cup of rose tea? Place oil and chocolate chips into a medium microwave safe bowl. Microwave on high for 30 seconds. Stir with a rubber spatula. Keep heating for 30 seconds at a time then stirring, until the chips have mostly melted but still have a few unmelted chunks. In another large microwave safe bowl, place the marshmallows. Heat in high for 1 minute. The marshmallows should still hold their shape, but look really soft, pillowy and fluffy. If not, keep heating in 10 second increments until they do. Stir the melted white chocolate into the soft marshmallow. Mix in the puffed rice. Quickly pour the mixture onto the parchment lined baking sheet and flatten it down with the spatula to about a ¾" thickness. Scatter the rosebuds and/or rose petals over the top and gently press them down so they stick. Let the fudge cool completely. Cut into pieces. Have guests remove the the rose buds and use them to steep in a cup of green or black tea, or hot water for a fragrant rose tea. Stovetop method: Increase oil to 3 T. and melt in a large pot over medium low heat. Add white chocolate chips and turn heat down to low. Stir occasionally until melted. Mix in marshmallows and turn heat up to medium. Stir until mostly melted. Turn off heat. Add in cereal, mixing to coat. Continue as above in step four. This version yields a slightly less "frothy" candy. Note 1: Use only culinary grade rose products to avoid any pesticides and chemicals. 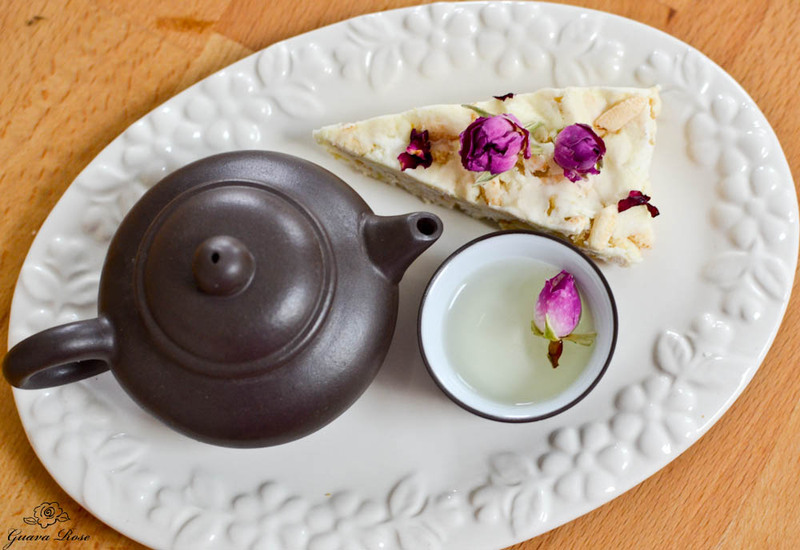 The whole rose buds and rose petals can be found in specialty tea shops, or online as "rose bud tea" or "rose petal tea". Note 2: Dried rose petals are used in Middle Eastern dishes and may often be found in Middle Eastern grocery stores. Note 3: Generally higher priced rosebuds have better fragrance and flavor than lower priced ones. Also, dried rose petals tend to be less fragrant and more tart than whole rosebuds.